Admittedly, dishes featuring chicken gizzards are a hard sell and some of you will go no further than the picture above (Just click HERE, Cynthia.) and that’s fine. Believe me, the majority of my family will be going with you. Since this blog was conceived as a means of recording and sharing my family’s recipes, however, I’d be remiss if I failed to mention these two. Who knows? Some future Bartolini Clan member may wish to know how to cook chicken gizzards and they won’t need to look any further than right here. Mom and Zia were little girls when the Great Depression struck and our family, like so many others, was hit hard. By all accounts, these were lean times and our Grandparents struggled to put food on the table and keep a roof over their heads. Both Bartolini Girls marvel(ed) at how Grandma could make a single chicken last a full week, feeding a family of four in the process. Well, that’s when she could get a chicken. Both of today’s recipes come from that time. 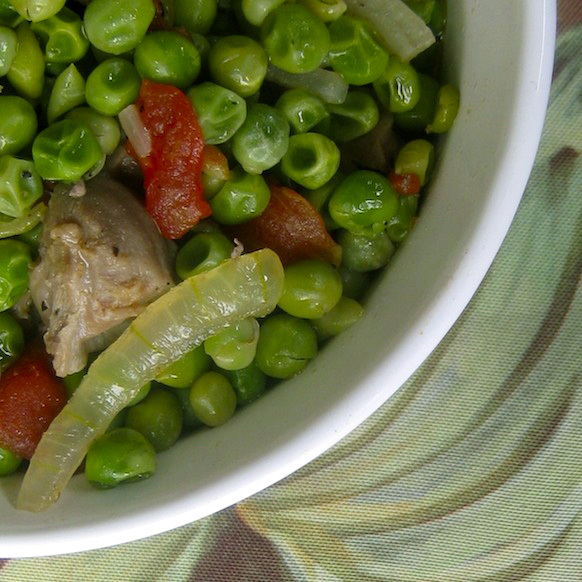 Mom often served us the first, a side dish of peas with gizzards, when I was growing up. No need to explain why it wasn’t an especially popular dish with my siblings. The second is a pasta dish that I “created” on my own. I remember telling Mom about it and, somewhat surprised, she recalled that Grandma used to make the same dish. Zia has mentioned that, as well. Since neither had ever mentioned or served me this pasta, I think it’s a sign that Grandma wants this dish prepared and, by sharing it here, I’m just doing my part to see that her wish is carried out. I can’t speak of packaging during the Depression but, in today’s markets, one can usually find chicken gizzards and hearts sold together in 1 pound containers. Once cleaned and trimmed, I’ll divide them, with a quarter being reserved for the peas dish and the rest for pasta. One of the 2 portions will be set aside, even frozen, for later use. Cooking these meats can be a little tricky. To brown them like one would, say, beef chunks for stew, will render them nearly inedible. That shouldn’t be a problem if you follow the steps outlined in the recipes that follow. Place gizzards, half of the onion, and enough lightly salted water to cover into a medium saucepan, Cover, bring to a boil over med-high heat, and reduce to a soft simmer. Cook for 1 hour, checking periodically to ensure enough water remains. At the end of an hour, pour the pan’s contents through a strainer, discarding the onion and stewing liquid. Slice the remaining onion portion and roughly chop the stewed meat. In the same pan, heat oil and butter over medium high heat. Return gizzards to the pan, along with the sliced onion, and sauté until the onion is soft and translucent. Add tomato and sauté for a minute before adding peas, cloves, and a few tbsp of water to the pan. Season with salt and pepper, cover, and cook about 5 minutes or until peas are done to you liking. Heat oil in a deep skillet over medium heat. Add gizzards and cook for 5 minutes. Do not allow to burn. Add onion, season with salt and pepper, and cook until translucent. Add garlic and sauté for 1 minute before adding the wine. Cook until almost all the wine has evaporated. Add the tomato paste and sauté for 1 to 2 minutes. Add parsley and tomatoes. If using whole tomatoes, tear them apart before adding to the pan. Season with salt and pepper. Bring to a boil, cover partially, and reduce to a soft simmer. The sauce should cook for 45 minutes. Check the pasta’s package directions and time its cooking so that the pasta is about 2 minutes shy of being al dente when the sauce is ready. Reserve some of the pasta water before adding the pasta to the frying pan. Mix well and continue cooking until the pasta is done to your liking. Add some of the reserved pasta water to the pan if the pasta becomes dry during this last step of the cooking process. Serve immediately, garnished with the grated parmesan cheese. And so ends our treatment of chicken gizzards and hearts. Oh, don’t you worry. We’ll be coming back to these ingredients when the Bartolini Family Risotto recipe is shared. That won’t be for a while, however, so, all you chickens out there can rest easy. Your giblets are safe — for now. 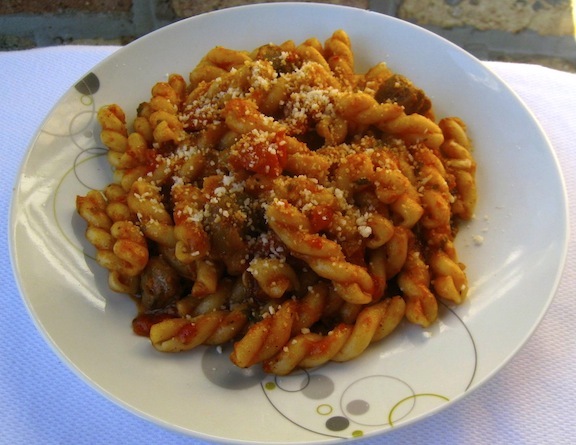 This entry was posted in Family Recipes, Pasta/Rice/Soups (Primi Piatti), Sauce/Gravy (Ragù/Sugo), Sides (Contorni) and tagged Chicken, Cooking, family recipes, Italian, Pasta by ChgoJohn. Bookmark the permalink. I live in the land of Gesiers (chicken gizzards). To my wife’s despair they appear in nearly every restaurant salad, travelling under the name of Salade de Campagne, or Traditionel. I like them, but I wouldn’t miss them – certainly not as much as the chicken misses them. Hehehe, the poor chickens. Yes, I enjoy them but certainly not enough to see them on every menu whenever I go out for dinner. A classic case of too much of a good thing. Well, I went with Cynthia, then i came back and well the pasta does not look too bad, but I don’t know..My John and the matriarch can eat them by the bowl full. Maybe I will show this recipe to them.. I might have a boiled egg..! Sorry, Cecilia, but I’ve a feeling quite a few will be joining you & Cynthia. Offhand, I can think of 2 siblings who certainly did. I hope your husband enjoys the recipes. Let him know that sometime in the future, I’ll be sharing the family’s risotto recipe that features, your guessed it, more gizzards! Never really cooked with gizzards before, but I’m game for trying anything at least once. I’ll start with the pasta recipe first though. 🙂 Thx for sharing! To tell you the truth, I would have thought you’d already tried them. Your blog’s recipes are so wide-ranging that I’m surprised chicken gizzards aren’t a part of them. Well, then, if you’re going to give them a shot, you’re right. Pasta is the way to go first. Good luck. That baby’s face tells it all! Thankfully, and I say it with a smile, my mother did not make gizzards! Liver yes, and only my father’s liver and onions did I like. I do have to admit your pasta dish looks really good and if you didn’t tell me what was in it, I’d go for it! Be true to your blog and keep on posting your familiy’s recipes, they are all so special! The baby is one of the newest members of the Clan and, yes, his face does tell it all. I knew that most wouldn’t “appreciate” this recipe, although a few would love the idea. There just isn’t any “grey area’ when it comes to organ meats. One things’s for certain: Zia’s going to get a real kick out of this posting! Thanks, Linda, for the encouraging words. My mother fried chicken livers and gizzards – dredged in flour then popped in a hot skillet of oil. I would try the livers – and they weren’t too bad as long as I didn’t dwell on what they actually were! Ritchey, on the other hand, would relish both of these recipes! He has eaten everything known to man, and a few things that aren’t! If you love gizzards, then you really will like Grandma’s risotto. But what is it about peas? You’re not the only person to not like ’em. Well, at least you like gizzards. We’ll work on getting you to eat your peas. I actually like eating the heart and gizzards. My mom used to chop them finely and ‘hide’ them in stuffing. This is so timely. The other day at Kroger Katherine saw them on sale and said you want to give them a shot. I said no thanks. Now look at these beauties. Deep-fried, Southern style is how my grandmother made them… They were pretty good, as I remember. Now, I eat them in salads when we’re in France, and love them to death – in small doses. Your “in small doses” gave me a good chuckle. I’ve never had them deep fired but that sounds delicious! I just might give ’em a try. Thanks for the chuckle & inspiration! Me too used to eat chicken gizzards when a little girl, I guess moms like to challenge their children… But now I like them and your recipe give the chance to “challenge” my children now. I am very thankful my parents introduced us to quite a variety of foods so that now, as an adult, I’ll try just about anything — OK, not insects. I’ve a feeling you’ve done the same with your children. You’re too good a cook not to. Oh the poor little poppet is so upset in that photo! I love chicken livers – not much of a heart person I don’t think and can’t really say what I think of the gizzards – I do know that my dad would love this though! I would be willing to give it a try before saying I do or don’t like it. Yeah, the little guy was not happy that morning. Hearts & gizzards aren’t for everyone, to be sure. My siblings won’t go near them — which meant all the more for me. Still, I prepare them very infrequently, which probably increases their allure for me. Thank you, Mandy, and enjoy your evening. 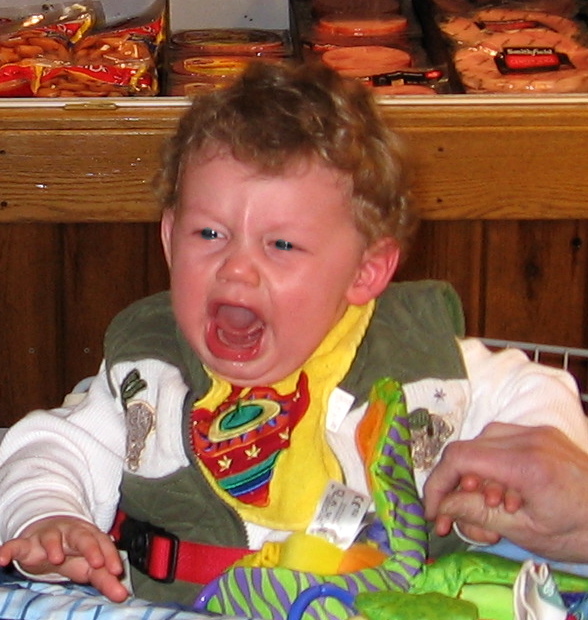 Love the crying baby photo! And the gizzards sound good – I especially think the savory little bits of meat in with the sweet peas is a nice couterpoint! I’ll make this! Even though I am not fond of chicken gizzards and hearts, I did enjoy your post and specially the history behind it. In fact, Italian cuisine – specially Roman cuisine – is full of recipes with entrails, and your story helps me in a way this culinary tradition. Thanks!! You are not alone. There are many in my family who will not eat these meats. For me, so many of these recipes are coupled with family memories, and so with Zia. If one of these recipes are prepared and served, it will very often trigger stories from her childhood and or life. I have learned a great deal in her kitchen and at her dining table. Thank you for taking time to leave so nice a comment. I have to try these recipes as soon as I can! Please do and I hope you enjoy them. For me, they are a reminder of home and that makes them so much more enjoyable. Thank you for stopping by and commenting. We love gizzards and I am making this tonight. Got to #4 in the directions . . . tomato paste? Not in the ingredients. Will have to guesstimate but please add it to the ingredients. Otherwise, easy prep and something we will enjoy. Thank yo so much for catching my error. I’ve updated the Ingredients list to include “2 to 3 tbsp tomato paste”. Hope you enjoyed the recipe and are having a fantastic holiday season!